Ring in the New Year with Intention, Clarity and Hope. soirée that began with a shared meal and had lots of dancing and merry making! 2017 comes to a close celebrating the birth of our first grandchild, Anthony Michael Bayush born on December 14 to Johnny (my son) and his wife Megan. This has opened my heart in ways I never could have imagined! The measure of time and the events that occured this year for many of us for varying reasons have been life altering and require us to be grounded in values and to show up for what we care about and for one another. For me, this is the ongoing inquiry of how I am living my thoughts, beliefs and actions in a way that allows all to have access to wellness for mind and body, that allows all beings to have their own agency in their own bodies as they show up and freely and safely navigate in their environment and be able to live in peace with one another. 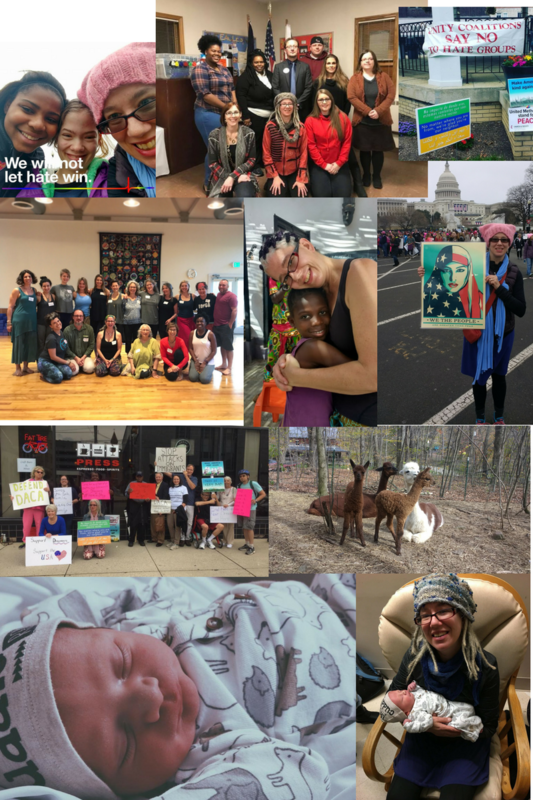 This is the work of collective liberation and solidarity with one another in the common pursuit of freedom. Freedom from our own biases. Freedom from institutional and societal barriers. Freedom from the need to rank identity. For me, ethically, then and only then, we can say Namaste and We Are One. 2017 has been one of the most interesting and challenging years where we have witnessed all over the planet, but certainly here in America, the worst and best of humanity. We have seen the veil lifted and what has surfaced is crass, base and seeks to demean the sustainability of human life and all species of life on the planet and the reinforcement of ranking of identities. How do we respond to this? How do we continue to respond to this? The foundation for responding to this has been grounding deep into the Mystery of God, or whatever you call that which has a greater intelligence than us. To deeply nurture myself and give attention and care to the relationships of family and beloved friends. Our family has also committed to practicing Sanctuary and continue to welcome those who are in need of supportive, healthy, safe places to heal and live. This Year part of my response has been to take part in grounding myself and committing to the work of building an anti racist white identity. I have been learning and growing through this work with several organizations and hope to be able to bring this into my community. I spoke about this at Penn Highlands community college with a Sociology Class and it was a great opportunity to have this conversation with white people about going beyond racism and other “isms” as personal beliefs. Part of this response involved traveling on Jan 21 to Washington DC with approximately 500,000 people in that location and up to 5 million people worldwide. I attended this with my daughter and her best friend and a bus full of Johnstown women. It was one of the most affirming, positive days of my life and am so blessed to be part of that history with my daughter! Part of this response involved taking a leadership role in reactivating the Unity Coalition of the Southern Alleghenies and working in community to bring collective liberation to our area which has a history of racism and bigotry but also recently elected for the first time, 2 African Americans to our City Council. 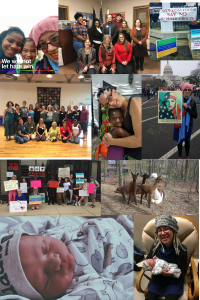 Unity has participated in rallies against hate in our community and in our nation and we are prepping for a “No Room for Hate”Campaign in 2018 as well as many more opportunities for education and community building. Part of this response is also committing to doing the work of wellness so that all can have access. This year saw an opportunity at Omega at Yoga Service International to take part in a social justice/sacred Activism leadership training with #CTZNWell. 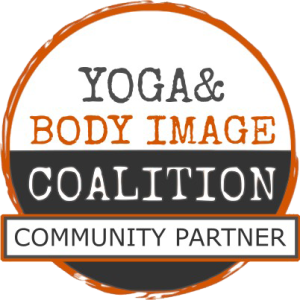 Another opportunity arose as I became a Community Partner with Yoga Body Image Coalition, an organization with an intersectional feminist approach to body positive imagery, teaching and sharing yoga practice in community. I also decided to make the Home studio offerings all contribution based. This allows us to offer shared practice to all who wish to participate. Contribution can mean more than money. It can mean Presence. Contributions are anonymous so what people contribute is only known to them. This has opened up practice and allowed us to create here a community where all contributions are welcomed and valued. Success to me in a neighborhood that is underserved is one Saturday morning, having half the participants walk here. I love the community that is growing here with Saturday morning yoga, monthly music and meditation, the Sacred Activism Sangha and Conscious Dance! It is not about numbers here, but authentic relationship and a place of belonging. I am also blessed by the new community partnerships this year that have allowed me to share practice with those who otherwise not have access. Joining my partnerships that I currently have with Bottle Works, Women’s Help Center, Victim Services Inc, Beginnings Inc, Twin Lakes, and Cambria County Prison are: Torrence State Hospital, Our Place Mental Health Drop In Center, and the Community Cares Support Group for individuals who are HIV positive. I look to continue to sustain these and grow more of these partnerships. So, my ongoing response to the events and challenges is to be emergent. To cultivate and build capacity to withstand ongoing negativity. To build resilience and nurture and expand inner and outer supports. To show up in my beloved community and take a stand against violence, and bigotry of any kind. To walk in love. To have faith that Hope arises from despair. To believe that we are here for each other. That Love bears all things. My blog post last week shared my word for 2018. Commitment. I want to be all in. We will be working with this setting of intention and what that looks like in all areas of our lives in all classes. And so, in turning towards the New Year with awareness of tools and supports, am excited to share a new effort in the New Year. Partnering with Owen Standley, I will be offering a bi monthly podcast that will share tools for navigating through chaos drawing from yoga ethics and Wisdom Traditions. More later on that. For now, honor in whatever way feels supportive, the ending of this year. You are here if you are reading this. You have your “one wild and precious life”as Mary Oliver states so beautifully. Find that tenderness when vulnerability shows up. Ground and strengthen your tenderness and fierce compassion muscles! The world needs you! Happy and Blessed New Year!